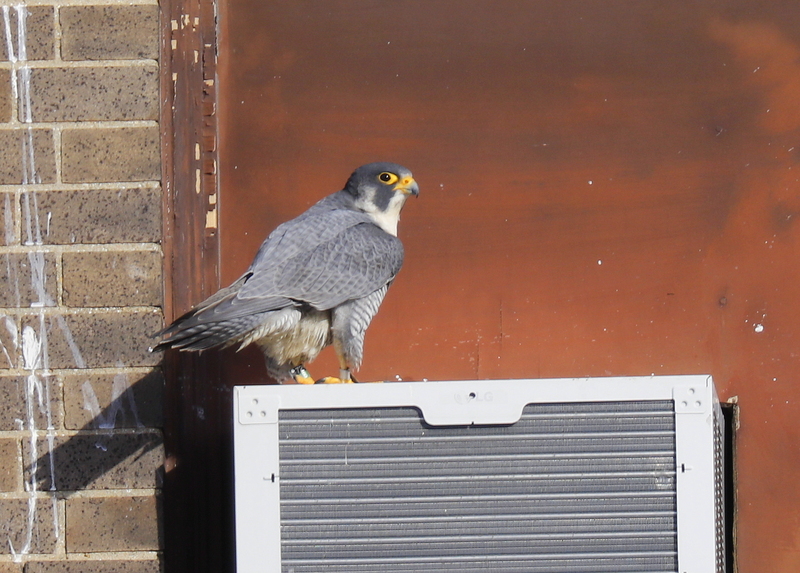 You are browsing the Blog for peregrine falcon haverhill. 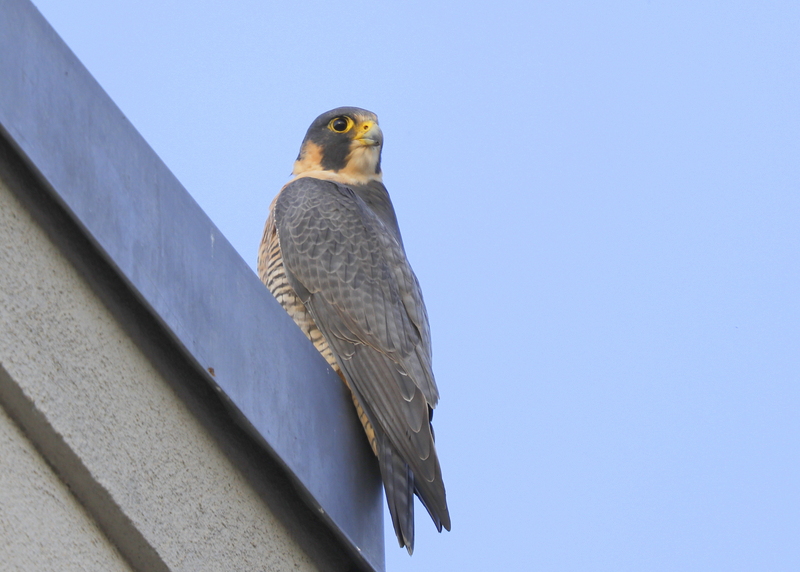 Made a pass through downtown Haverhill and found both adult falcons atop the apartment building at 170 Washington St. They were perched facing east and into the morning sun. After 12 minutes they both departed, a few minutes apart, for another regular perch, atop the Post Office and the Bank of America building to the east. To the right is the unbanded female. 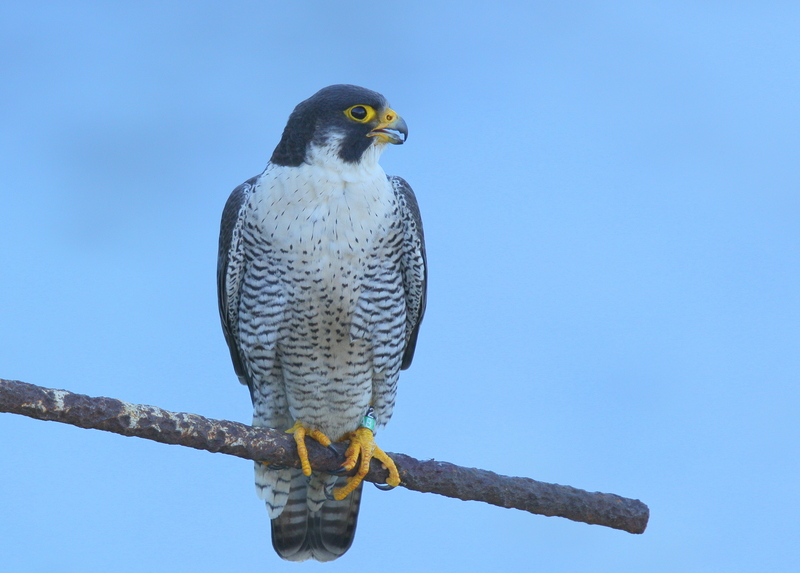 The male falcon ‘black/green 72/AB’ – color-banded in NH in May 2012, and now approaching 6 years old. This wild-hatched male was one of two chicks fledged from the falcon nesting box located at the Brady-Sullivan Tower in Manchester. Christian Martin banded him as a 25-day old chick, along with his 21-day old sibling, who later died after falling into an uncapped chimney at the nearby National Guard Armory, and was trapped out of sight in a basement boiler room. Black/green 72/AB has been present in Haverhill since at least December 2014, when he was spotted and identified by local resident, and well-known NH birders, Steve & Jane Mirick. 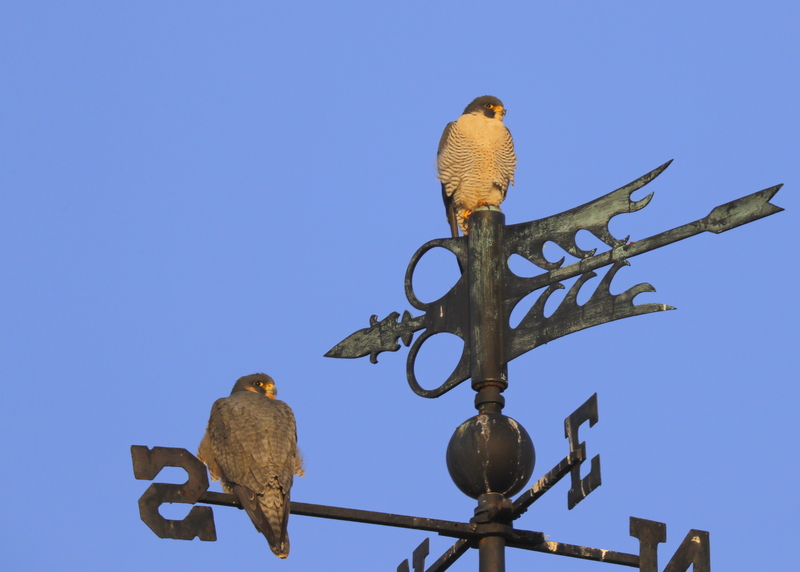 Pair of Peregrine Falcons on the weathervane at the Post Office in downtown Haverhill. This adult pair was first discovered by Steve and Jane Mirick. They were not successful in breeding attempts in 2016. The male is perched atop the weathervane with the female below to the left. They both departed in pursuit of prey and returned a short time late. They were observed under bright sun and clear skies with little wind and temps in low thirties. This pair has not been sighted for the last few months, so this is a welcome sighting and a promising sign of continued pair bonding! The male provided nice looks at his leg bands. The alpha-numeric black over green left leg bands showed 72/AB. According to Chris martin at NH Audubon, this was a 2012 hatch year chick, 1 of 2 banded at Brady-Sullivan Tower in Manchester NH on 5/10/2012. 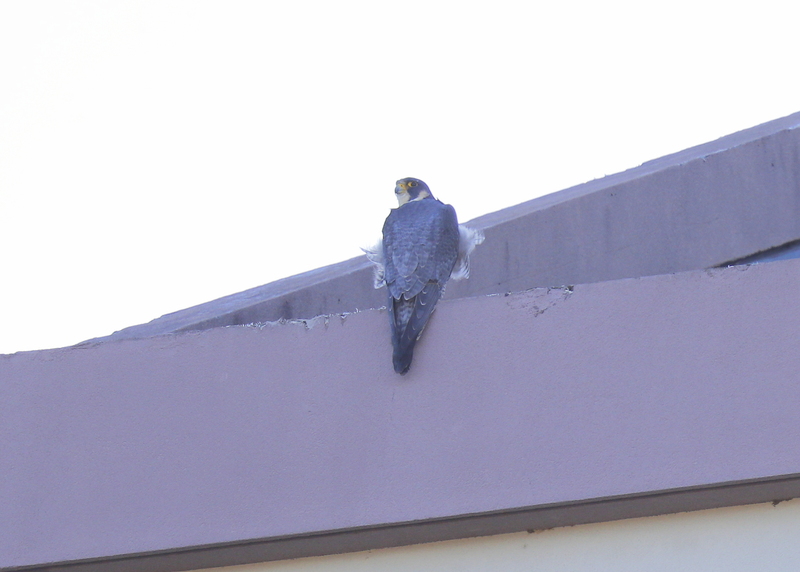 The Peregrine Falcons in downtown Haverhill continue to hang out atop the roof at apartment building on the east side of the railroad bridge. No indication of where the nest will be this year, but we should know within the next week….stay tuned! 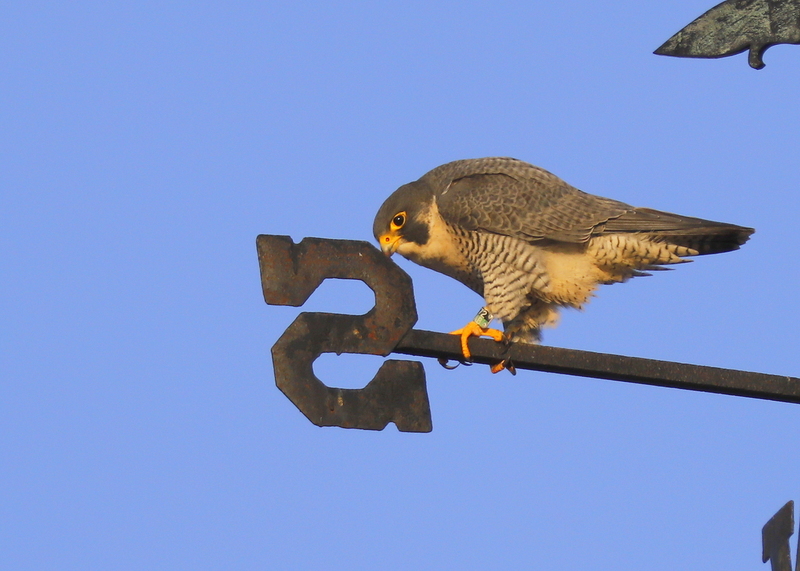 This morning,one of the adult peregrines was enjoying the morning sun! Made a late afternoon pass through downtown Haverhill and found both peregrines atop the east side of the roof at the Viewpoint Apartments located at 170 Washington Street. The east side is all shade late in the day, so both photos less than clear, but help to provide sense of where they are perching in late winter. They have view looking east of the Merrimack and the bridge. Made a visit to downtown Haverhill on this morning in search of the local pair of peregrine falcons under overcast skies, light winds from the west, and temps in low 50’s. 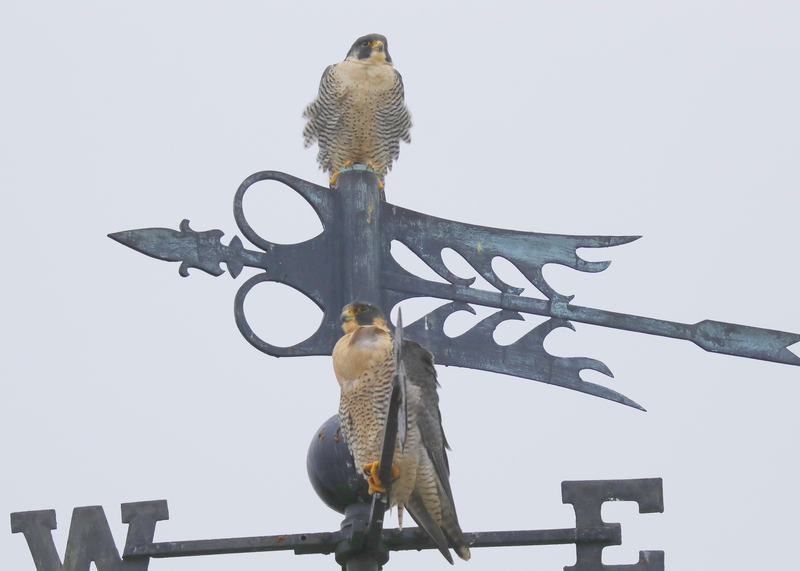 Lo and behold, they were perched together on the weathervane atop the Post Office, next to the busy bus station. No ability to observe leg bands! 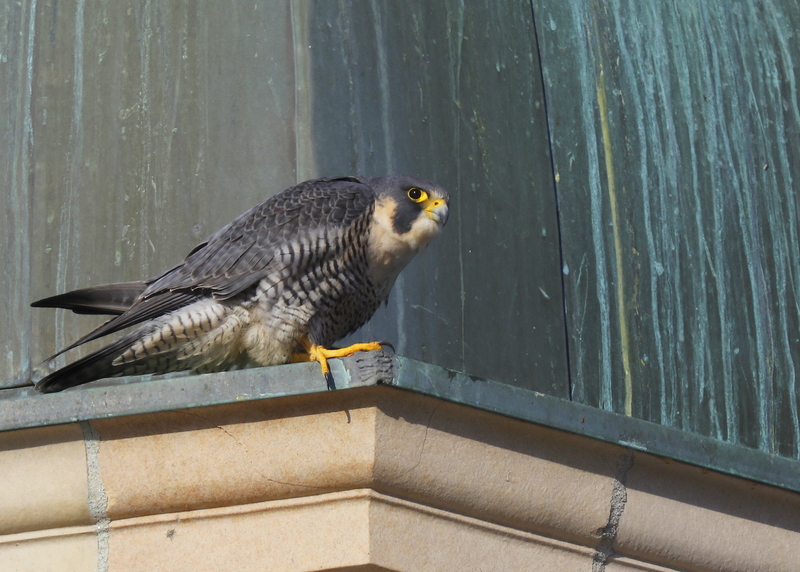 Peregrine Haverhill: female on rooftop! As the sun was setting, made a late day visit to downtown Haverhill in search of the Peregrine Falcons. 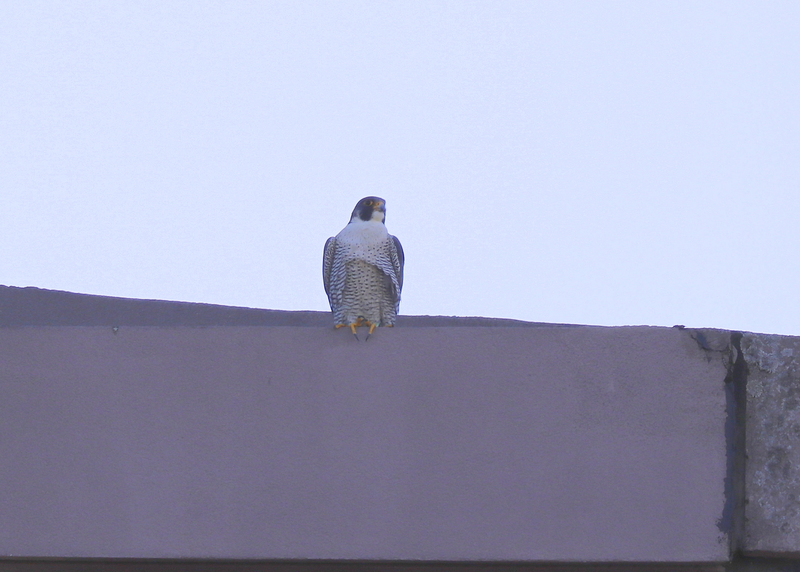 After searching high and low, and with quite a bit of luck, was able to locate the unbanded female on a rooftop corner on the north side of the Merrimack River, just on the east side of Riverfront Park. 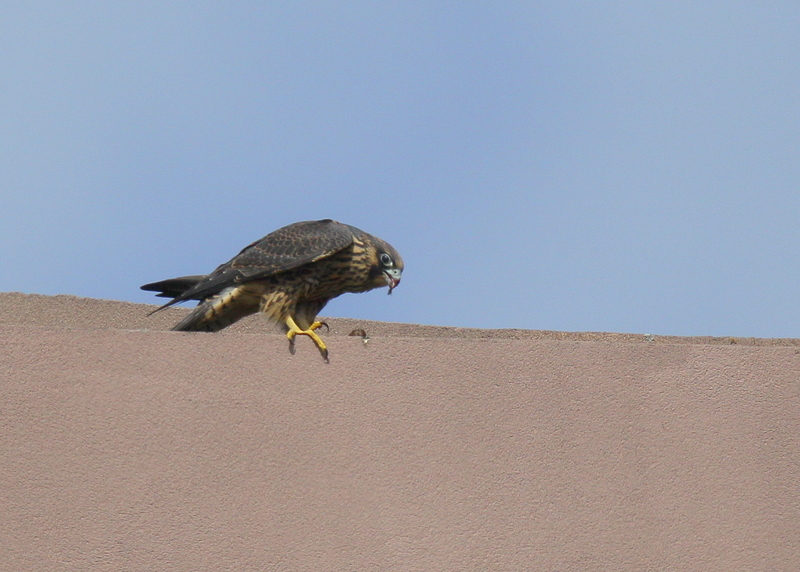 After a bit, it made a short flight to the rooftop to the west and joined the male who had been perching on the east side of that building….so BOTH! 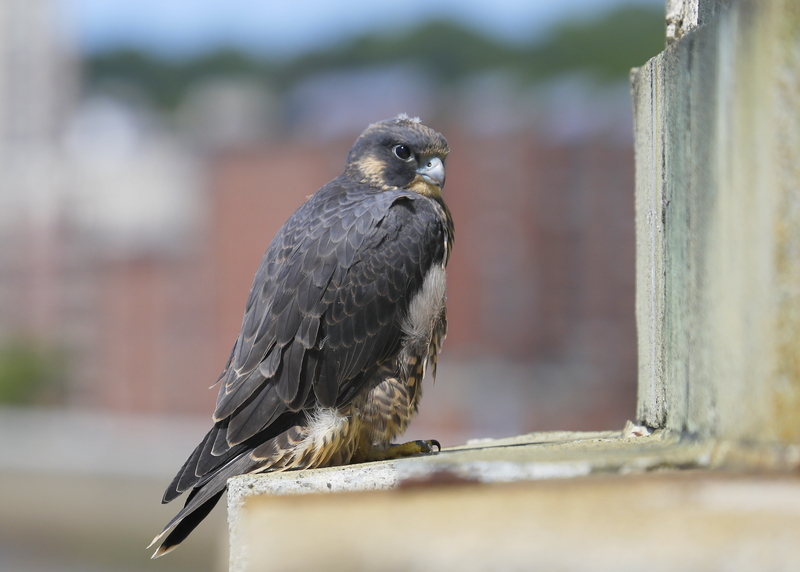 One of the fledglings was seen along this roof edge atop a 12 story building located at 170 Washington St. beside the Merrimack River. 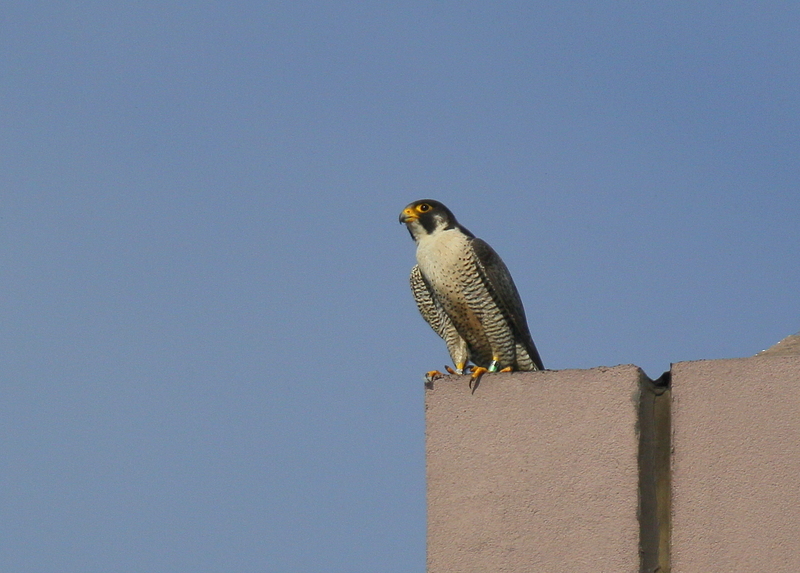 The adult male (leg bands 72/AB) was perched nearby on the southeast corner of the roof top. Shortly after fledging, young falcons remain close to the local nest site and are frequently observed perching on nearby buildings. The youngsters beg for food from the adults, often loudly vocalizing. In addition, the chicks must develop and perfect their flying skills. For the first few weeks, when perching on a ledge, the young birds are often described as “dragging their wings,” “almost toppling over,” or “tilting.” Although they may appear in distress, these are all normal behaviors. 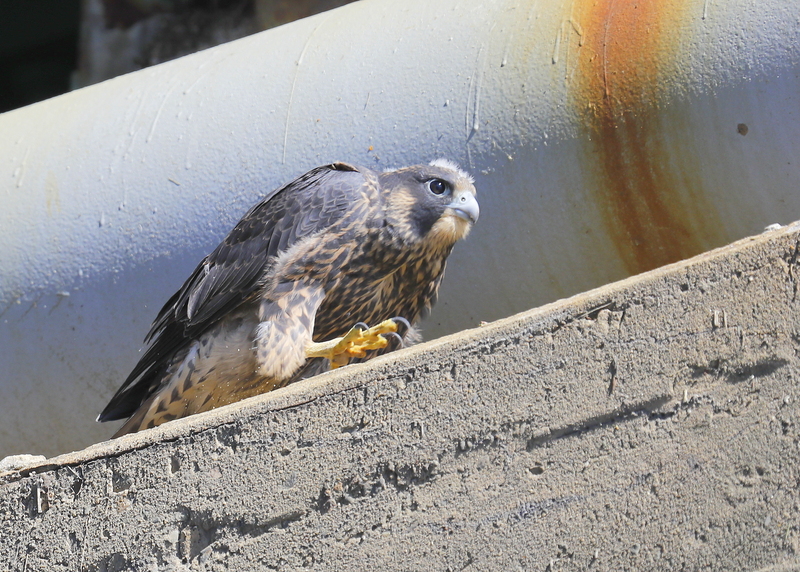 Once they leave the Haverhill area, avian biologists are unsure where the young falcons go. 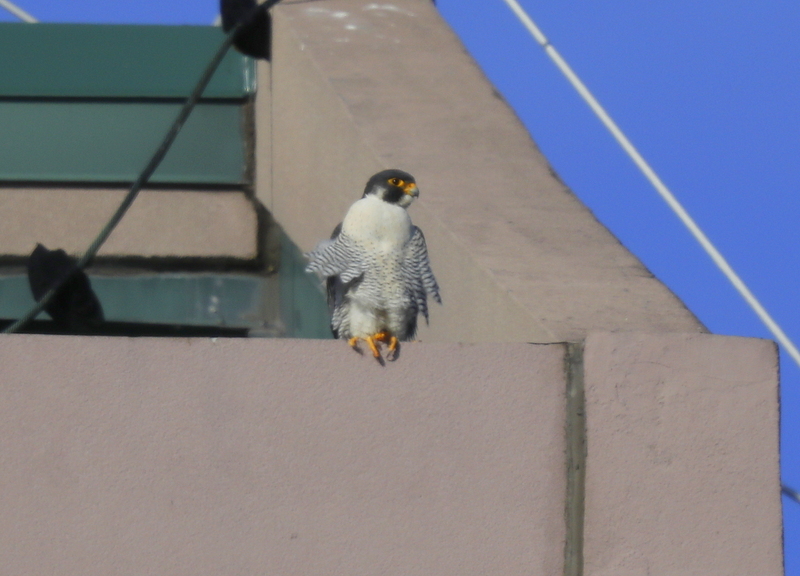 Under bright sunny skies, the male peregrine with leg bands (72/AB) was observed perched on the outstretched piece of rebar from the bridge. in the morning the rebar remains in the shade until much later in the morning. The peregrine was unfazed by nearby light pedestrian traffic this morning. This side view provides an informative view of it’s bill and more specifically, the tomial tooth. Found in falcons, kites, and accipiters, the TOMIAL TOOTH is the outer, or cutting edge of of the beak. This “tooth” is the protrusion that extends from the tomial edge of the beak and is thought to be used to deliver the killing blow to prey. The tomial tooth of the upper mandible is often matched by a mandibular notch, or divot, in the lower mandible. This tomial tooth system is important because not all raptors rely solely on their muscular feet and talons to dispatch their prey. Birds like falcons may grab their prey and then use the lever-powered beak to sever the spinal cord of the prey that they catch. They slide their beak over the neck of their prey and use the upper and lower mandible to sever the spinal column. This sounds cruel, but it’s quite efficient and puts the prey out of discomfort very quickly. One of the fledglings in Haverhill found a comfortable ledge on the bridge for loafing and snoozing. This chick showed little concern for passing traffic and less frequent passing pedestrians. The ledge, in the middle of the bridge on the west side, was just right for snoozing in the sun. It would sit up for a bit and then lay back down. Mom was nearby perched on a branch in a tree on the south side of the Merrimack River. A few remaining white down feathers are seen on the crown and sides of this young falcon.